I’m not giving you five reasons for anything. That’s my virgin sacrifice to the SEO Gods. Also there are more than five reasons why I’m so delighted with this book. Mostly because it validates what I’ve finally begun to figure out on my own. Cooking. It’s not about recipes. It’s about techniques. Understand and gain mastery of the techniques, and you probably won’t have cooking disasters like this. Or this. Think. Salt. Egg. Butter. Dough. It goes on from there. All the basic basics I didn’t get at the knee of my mom or grandma. The first and most important, also the most profound to me, is the exact reason I can even call myself the Bad Home Cook. This is hard for me to do. Still. Pretty much sums it all up in that one sentence. This is where I go wrong time and time again. And the only reason I’m improving at all is because I’ve learned this. The hard way. Over and over. This is a small book, simply written, with basic recipes and photos. But it’s an important book because I think that given the Food Network age we live in, it’s taken for granted that people in general know basic cooking techniques. When in fact I am living proof that they do not. A good example. The chapter about salt was extremely informative and has already changed the way I cook for the better. Longtime readers of this blog (and I’m sure I’ve actually fed all five of you) know well my trouble with seasonings. Ruhlman relates a story about how in cooking school he was taught to flavor the water he was boiling up for pasta. In other words, a pinch of salt ain’t gonna do it. Taste it to make sure it’s well-salted, like you would a soup. That flavor will imprint in your pasta. Season fearlessly, early on in the cooking process, and throughout. You shouldn’t have to season at the table. And use Diamond Crystal Kosher salt because it doesn’t have anything in it (no anti-caking agents, for example) that will leave chemical taste in your food. Duh. Of course. Elementary. But nobody ever told me this! I only learned about that “pinch” of salt because that’s what my junior high school home economics teacher told me. I like having the basics spelled out. That’s why my copy of Mark Bittman’s How to Cook Everything is in 17 pieces and held together with paper clips and rubber bands. It’s got all the basics and it’s very well-used. 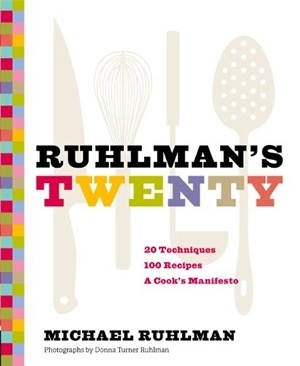 Ruhlman’s Twenty will be similarly well-used…although digitally. Maybe it’s time for an iPad. Agree with you, except….it IS often about finding the right recipe. If you start with the right recipe, you are 3/4ths of the way to a good meal. You start with a basic understanding of techniques, and then you try out some curated recipes, and the more you cook, the more confidence you gain to tweak and change to suit yourself. Not everyone is an intuitive cook (some are, of course, and more power to them), but for those who need to start with basic guidelines, a recipe is a godsend. I’m not just saying that because my recipes are good, but because even mediocre cooks, when armed with a good/great recipe, can produce a delicious, praiseworthy result. Here’s a toast to mucking around in the kitchen, cooking up some wonderful stuff, and enjoying it at the table with family and friends. Cheers! Intriguing! My mom cooked all the time when I was growing up but taught me nothing. The only thing I knew how to make when I left the house was scrambled eggs. I taught myself how to cook during college by following recipes meticulously (I’m a scientist) and now I have enough experience to feel confident in the kitchen but I still love recipes. This book sounds fantastic though and I think I probably could have averted some early misadventures if I knew those techniques. Anyway, GREAT WORK! So I nominated you for a Liebster Award. Next post: Beurre blanc? Me?